Ajmal Amir Kasab, the lone surviving Pakistani terrorist responsible for the 2008 Mumbai terror attack, was hanged at Pune's Yerawada Jail Wednesday morning, Maharashtra Home Minister R.R. Patil said. "All the legal procedures in the 26/11 terror attacks case were completed. He was sentenced by the trial court, which was upheld by the Bombay High Court, Supreme Court, and his mercy plea was rejected by the president. Accordingly, Kasab has been hanged this morning at 7.30 a.m. in Yerawada Central Jail," Patil told mediapersons. Kasab's mercy petition was rejected by President Pranab Mukherjee Tuesday night. Shortly thereafter, in the dead of the night, Kasab was shifted amid top secrecy and tight security to Pune's high-security Yerawada jail. Kasab executed secretly in Pune's Yerwada jail Ajmal Kasab, who was kept at the Arthur Road Jail in Mumbai, has been hanged in the high-security Yerwada Jail in Pune. This morning, at 7.30 a.m., he was hanged in the jail premises after which a team of doctors declared him dead. 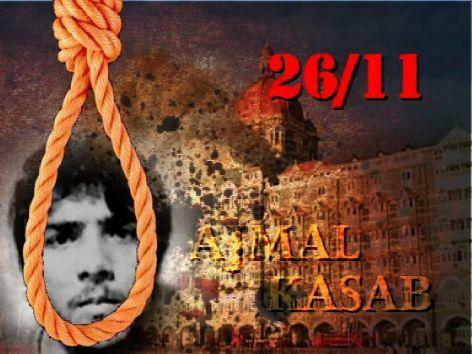 "The punishment to Kasab is a true tribute to the victims and martyrs of the 26/11 Mumbai terror attacks," Patil said. It is not known where Kasab's last rites shall be conducted. In January 2010, nine of Kasab's associates, who had sneaked into Mumbai on the night of Nov 26, 2008, to unleash three days of terror, were quietly buried at an undisclosed location near Mumbai.